Symphony Orchestra - There are generally more violins than any other instruments in an orchestra. Orchestra's have two sections of violins known has the first and second violins. They each play a different part. In a modern orchestra there will usually be around 16 violinists in the violins I and 14 in violins II. The violin is used in other music as well including folk music, rock and pop music, and jazz. In folk music the violin is often called the fiddle. The fiddle is the same musical instrument as the violin, but the style of music played is different. Fiddle music is generally folk music played with a lively beat that people can dance to. In pop and rock music the violin is generally part of a string section played as part of the background. 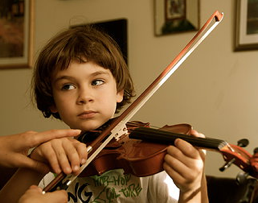 Learning to play violin is not just the way to become a good musician. History of such geniuses as Albert Einstein and Ben Franklin shows that the violin playing skills are essential to make people really smart. MELODY MUSIC SCHOOL offers violin lessons for people of all ages and all skills.